Waffle On about Carry On Screaming. 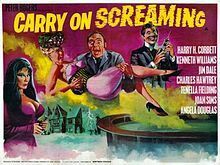 Hello and welcome to our 2018 Halloween special in which we chat away about this brilliant Carry On film starring Harry H Corbett, Kenneth Williams and Fenella Fielding. We also have a brief chat about the Star Trek Experience at the Birmingham NEC and a mention about this brilliant new documentary film that is coming out in November. Come and join our Facebook group, simply search for waffle on podcast in the search bar.